Rob Zombie is currently filming his follow-up to The Devil's Rejects, 3 from Hell, and he's bringing Captain Spaulding with him. Sid Haig has played the character in both House of 1000 Corpses and The Devil's Rejects, so it only makes sense that he would return to round out Zombie's trilogy. The director confirmed the news in a recent post to his Instagram account, which features an image of an intriguing police van transporting what seems to be three very familiar villains. Here's what he had to say about the image in his caption. "Day Two shooting 3 From Hell. Let's transport some villains. 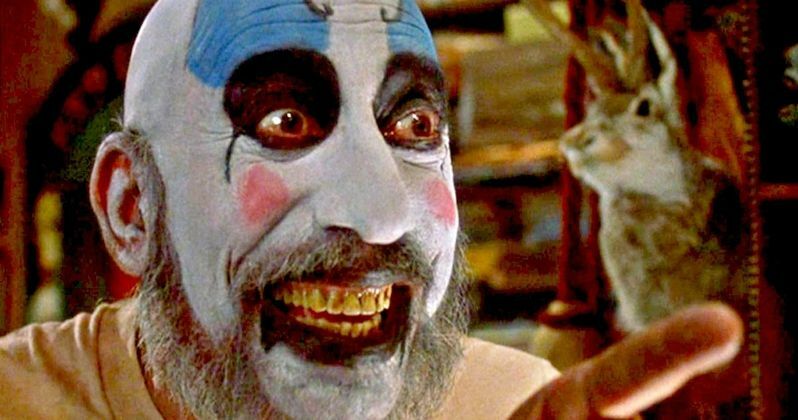 #3fromhell #robzombie #billmoseley #sherimoonzombie #sidhaig"
Those hashtags make it quite clear that Sid Haig is coming back as the infamous and nefarious Captain Spaulding, alongside Sheri Moon Zombie as Baby and Bill Moseley as Otis. Aside from confirming the casting for The Devil's Rejects sequel, this photo also raises some interesting questions, and possibly provides some answers as to how it starts. This police van is likely transporting Otis, Baby and Captain Spaulding, but are they dead or alive? That's the big question and, if they're indeed dead, how is it that they return in 3 From Hell to presumably continue their killing spree? It had been rumored for a few months that Rob Zombie had been quietly putting together The Devil's Rejects 2, but without warning, he took to social media earlier this week to not only confirm that the movie is happening, but that it's already filming and is officially titled 3 From Hell. While many are excited about the prospect of Zombie finishing up the trilogy he started years ago with House of 1000 Corpses, which had a famously troubled production and equally difficult road to its eventual release, it's tough to know right now how this is all going to come together. At the end of The Devil's Rejects, the trio of killers were gunned down in an epic blaze of gunfire and presumably killed. Their survival seemed at best improbable. Though, the 3 From Hell title does make it seem like Rob Zombie could be taking this installment down a more supernatural road. The Firefly Family could be literally coming back from hell only to return to the land of the living and kill some more. Whatever the case may be, this movie is already well on its way to being in the can. Despite the fact that Universal clashed with Rob Zombie over House of 1000 Corpses, the movie was eventually released and became a cult horror classic. The Devil's Rejects was released in 2005 and is considered by many to be Zombie's best movie to date. Still, it's been 13 years since we last saw this band of murderers on the big screen. Is it too late for 3 From Hell? Or is all of that time just going to add to the anticipation? We shall see. 3 From Hell doesn't currently have a release date. You can check out Rob Zombie's Instagram post for yourself below.